ELIEN: Roswell - Greek sign was found! 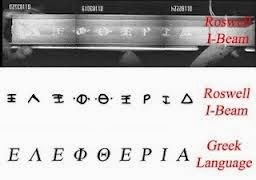 THE GREEK SIGN FOUND IN THE ROSWELL UFO FINDINGS! We all know the famous incident of the UFO crash at Roswell in 1947. Written and spoken many as among the wreckage, found piece with the Greek word FREEDOM. The video is old , reminiscent of early videos of the 40-50's. They seem debris from the control panel (?? ;) board where distinguished six fingers on each hand!! The ignorant officer aviation (? ;;) of the U.S. seems to hold and the shows (letters) upside down - since they may recognize the Greek character of writing, something that troubles me positively towards the authenticity of the material! It really means freedom, as shown in the picture above. Why are they hiding the real meanig of the sign? Don't tell me they, all the laguagists that have examined it haven't seen the exact resemblence of the Greek word "ΕΛΕΦΘΕΡΙΑ", meaning FREEDOM?? Tsalatzer and Columbia were destroyed. With the name Apollo the Americans went to the moon and by the name "Cosmos" the Russians made ​​in earth spins . In Greek Mythodia (more to come about this) from the famus composer Papathanassiou, there was a concert that took place at the Temple of Olympian Zeus, in Athens, Greece. The alligments were wright to target the song to Mars. Who would listening? And why did it not take place in America and spent so much money to produce it in Greece? The Roswell UFO incident took place in the U.S. in June or July 1947, when an airborne object crashed on a ranch near Roswell, New Mexico. Explanations of what took place are based on both official and unofficial communications. Although the crash is attributed to a secret U.S. military Air Force surveillance balloon by the U.S. government, the most famous explanation of what occurred is that the object was a spacecraft containing extraterrestial life. Since the late 1970s, the Roswell incident has been the subject of much controversy, and conspiracy theories have arisen about the event. The U.S. Armed Forces maintains that what was recovered near Roswell was debris from the crash of an experimental high-altitude surveillance balloon belonging to what was then a classified (top secret) program named Mogul.. 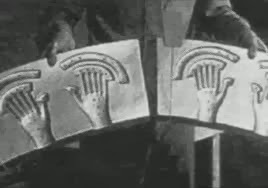 In contrast, many U.F.O.proponents maintain that an alien craft was found, its occupants were captured, and that the military engaged in a massive cover-up. The Roswell incident has turned into a widely known pop culture phenomenon, making the name "Roswell" synonymous with UFOs. Roswell has become the most publicized of all alleged UFO incidents. 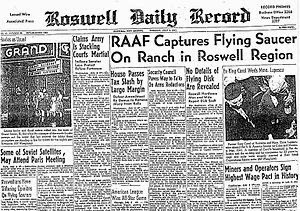 On July 8, 1947, the Roswell Army Ait Field (RAAF) public information officer Walter Haut, issued a press release stating that personnel from the field's 509th Operations Group had recovered a "flying disk", which had crashed on a ranch near Roswell. Later that day, the press reported that Commamding General of the Fifth Air Force Roger Ramey had stated that a weather balloon was recovered by the RAAF personnel. A press conference was held, featuring debris (foil, rubber and wood) said to be from the crashed object, which seemed to confirm its description as a weather balloon. Subsequently the incident faded from the attention of UFO researchers for over 30 years. In 1978, physicist and ufologist Stanton T. Friedman interviewed Major Jesse Marcel who was involved with the original recovery of the debris in 1947. Marcel expressed his belief that the military covered up the recovery of an alien spacecraft. His story spread through UFO circles, being featured in some UFO documentaries at the time. In February 1980, the National Enquirer ran its own interview with Marcel, garnering national and worldwide attention for the Roswell incident. Additional witnesses added significant new details, including claims of a large-scale military operation dedicated to recovering alien craft and aliens themselves, at as many as 11 crash sites, and alleged witness intimidation.. In 1989,former mortician Glenn Dennis put forth a detailed personal account, wherein he claimed alien autopsies were carried out at the Roswell base. In response to these reports, and after U.S. congressional inquiries, the General Accounting Office launched an inquiry and directed the Office of the U.S. Secratery of the Air Force to conduct an internal investigation.
. The result was summarized in two reports. The first,, released in 1995, concluded that the reported recovered material in 1947 was likely debris from Project Mogul. The second report, released in 1997, concluded reports of recovered alien bodies were likely a combination of innocently transformed memories of military accidents involving injured or killed personnel, innocently transformed memories of the recovery of anthropomorphic dummies in military programs like Operation High Dive conducted in the 1950s, and hoaxes perpetrated by various witnesses and UFO proponents. The psychological effects of time compression and confusion about when events occurred explained the discrepancy with the years in question. These reports were dismissed by UFO proponents as being either disinformation or simply implausible. But at the same time, several high-profile UFO researchers discounted the possibility that the incident had anything to do with aliens. Additional sources and info under the YouTube videos.